Let’s face it, manta rays and stingrays look pretty similar and you can only spot the differences if you know what you’re looking for. Both manta rays and stingrays are related to sharks under the cartilaginous fish group chondrichthyes, meaning their structure is built on material similar to that found in our nose and ears. They both have pectoral fins that have developed into wide, triangular wings, enabling them to glide easily through the water. Their eyes are located on their dorsal (top) side, and they have a long, eerie tail. 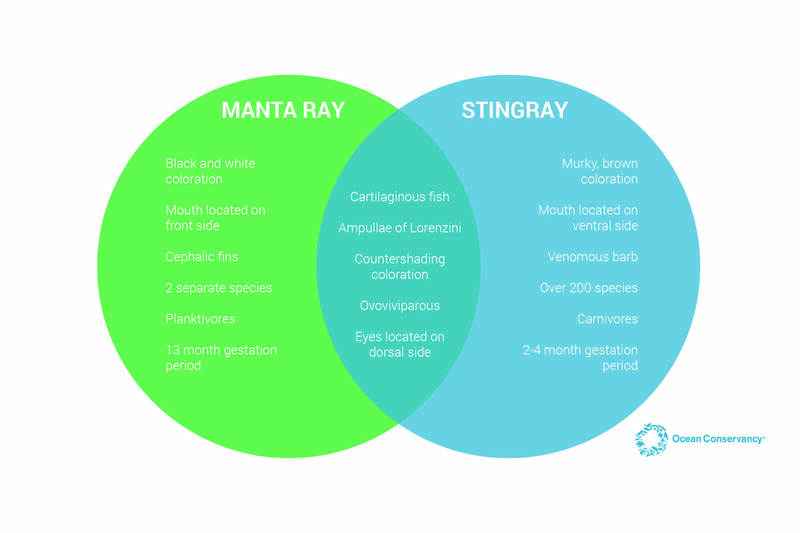 There are major differences, however, that can enable you to identify a manta ray from a stingray. We’ll walk you through them. Manta rays are classified into two different species groups, the birostris and alfredi. These two groups are extremely similar in looks and behavior, but you can tell them apart by their coloration and markings. Manta rays have countershading coloration, meaning they are dark on top (the dorsal side) and light on the bottom (ventral side). Rays under birostris have few spots on their ventral side, with wide, gray bands along the back edge of the wings and can reach a wingspan up to 23 feet. Rays under alfredi are generally smaller, reaching a maximum wingspan of 18 feet, and can easily be identified by their big, blotchy spot patterns located on their ventral side. In both groups, their mouths are located at the front of their bodies and they possess cephalic or “head” fins which enable them to funnel food and water more easily. Unlike stingrays, manta rays do not possess a “stinger;” they have a harmless, slender tail. Generally, female rays tend to be larger than males and can only be classified if you’re close enough to notice scarring on the back ventral side or fin tips, a sign that the ray is female and has mated with a male ray. Manta rays are ovoviviparous, so the baby stingray grows inside an egg within its mother and then is born completely developed. Gestation period for a female ray is around 13 months long and they only give birth to one or two young. A juvenile ray’s mortality rate is high since the parent does not tend to stay around to raise them, causing a low population growth rate for the species. Adult rays, however, have an average life expectancy of 25-40 years. There are more than 200 different species that fall under the classification of stingray. The most defining feature of this group is its infamous tail, which is tipped with venomous barbs, and is constantly being shed and replaced. There are stingray fossils that date back to nearly 150 million years ago and scientists have found evidence of ancient Greeks using the rays’ spines as anesthetic for dentistry as well as of ancient Egyptian craftsmen and merchants making leather from their skin. Similarly to manta rays, stingrays also have countershading coloration, but their coloring is more murky, dependent on their habitat near the seafloor. Instead of having a mouth in front, their mouths are located on their dorsal side, along with their gills and nostrils, arranging themselves into a cute, smiley face. Stingrays can grow to be 6 ½ feet with a lifespan of 15-25 years. Unlike manta rays, female stingrays have around one litter per year, bearing between two and six young after a two to four month gestation period. Stingrays are also ovoviviparous and newborn stingrays come out looking like little ravioli, only they’re alive and can swim. The mother usually stays with the young to provide protection, creating a lower mortality rate than that of juvenile manta rays. You can find manta rays roaming the open ocean in tropical, subtropical and temperate waters around the world. Birostris rays are specifically found in the Atlantic, Indian and Pacific oceans, whereas alfredi are rarely spotted in the Atlantic ocean, sticking to the Indian and Pacific Oceans as well as the Kona coast of Hawaii, a particularly hot spot for sightings. While rays tend to be solitary swimmers, they gather in large groups during mating season and during annual migration periods. Manta rays are at their most active during mating season and have been recorded breaching at heights of up to seven feet! By leaping into the air and smacking back down to the surface, manta rays can knock off parasites and any dead skin. Like manta rays, stingrays are native to tropical and subtropical waters, but have the ability to live in both saltwater and freshwater, with the latter found in parts of South America and Africa. They live their lives primarily on the seafloor, partially buried beneath the sand. Stingrays are also solitary but form large groups, called schools, during migration. Instead of jumping in the air like manta rays, stingrays visit “cleaning stations,” where they share a symbiotic relationship with smaller fish, like the blue-head wrasse or Spanish hogfish. In return for cleaning the mucus from their bodies, these little fish feast on a smorgasbord of parasites that latch onto the stingray’s body. Manta rays are primarily filter feeders or planktivores, but they also enjoy the occasional small fish. Generally, they prefer zooplankton, buffet-style, where they open their mouths wide and consume huge quantities. While manta rays do possess small, cusped teeth—between 918-1,456, in fact—they are not used for eating, but for mating. Sharks and orcas are predators of the manta ray and you can sometimes spot scars from attacks, but like sharks, manta rays have an electrosensory system consisting of hundreds of electroreceptive organs, referred to as the ampullae of Lorenzini, which help them sense other organisms in their environment using electrical fields and prepare for an attack if necessary. Stingrays feed on mollusks like clams, oysters and mussels, as well as shrimp and crabs. They possess jaw teeth, arranged in rows, which enable them to crush the hard shells of their prey easily. Like manta rays, stingrays also are able to sense other organisms in their environment through the ampullae of Lorenzini. In a lab experiment, scientists found that they not only use this special sixth sense for defense and attack, but also for orientation and navigation. Sharks are the primary predator of stingrays, and particularly the great hammerhead, Sphyrna mokarran, which uses its head to pin the ray down. In such cases, stingrays can raise their tails, like a scorpion, and stab their predators, but they usually run away from conflicts. While the tails have the potential to be deadly, stingrays are generally gentle with humans and only become aggressive when they feel threatened. In order to avoid accidentally stepping on one, experienced divers will shuffle their feet upon entering the ocean, emitting those electrical pulses. There is so much more to learn about stingrays and manta rays as well as similar groups like skates, guitarfish and butterfly rays. So the next time you find yourself in a heated debate during your beach vacation over whether that dark, triangular blob you spotted in the water is a stingray or manta ray, these tips might come in handy.